Two options are planned for the 5000. One self contained UCB that will employ a new front end to the existing relay matrix. This will be a smaller board due to the elegance of the Flexwire interface. The other option will be a daughter board for the existing UCB that will allow one to modify the original UCB for 5000 use. At this time we are all waiting for our 5000's. The UCB started early in 2005 by Tony Parks as a means of taking X2 data out of the SDR and allowing control of external activities related to what was going on within PowerSDR. Here is what Mike KM0T did with the early UCB that Tony designed. K3TUF picked up the project after discussions at Central States VHF Conference in 2006. The next iteration of the UCB will be available in early 2007, currently scheduled for the last week of January. 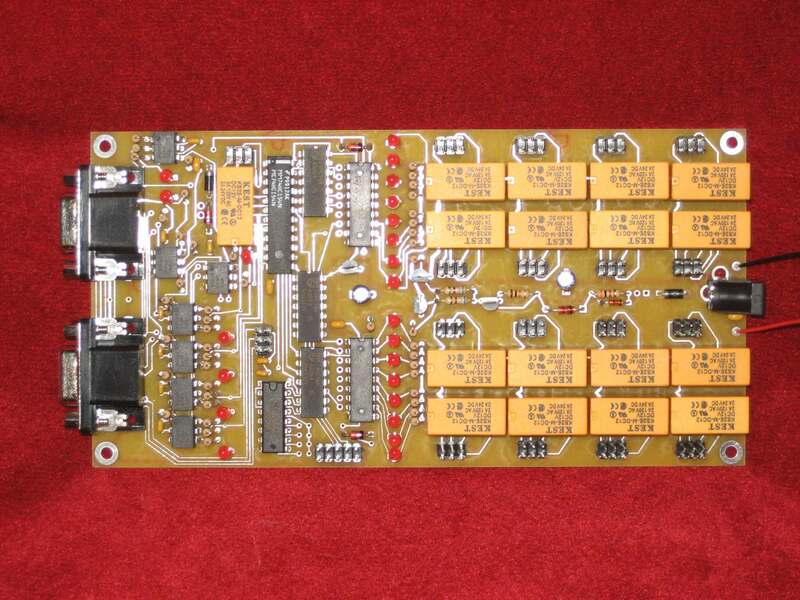 The UCB system connects to the X2 external control connector and has the ability to expand to four UCB boards for a total of 64 output controls. In addition to DPDT relay outputs for each selection, a DPDT output is provided for PTT activation as well as an input terminal for PTT input. PowerSDR is programmed to control all aspects of the UCB. The UCB is 7 inches long by 3.6 inches wide and takes 12VDC through two via holes or an optional 2mm DC connector. There are two sets of via holes after diode protection available to supply additional equipment DC power. Complete instructions with pictures of the assembly process will be on the website after the final boards are here. Note: the Alpha board is using temporary relays, the final relays are American Zettler. Alpha boards do not come with screen printing. Feb 12, 2007, Production PCB's have arrived and the initial orders have been filled. Kits are available.